One of Gwyn's Four Knights and the group's only female member, Ciaran lays waste to Gwyn's enemies through assassination and subterfuge. She makes her appearance in Oolacile in the additional content. 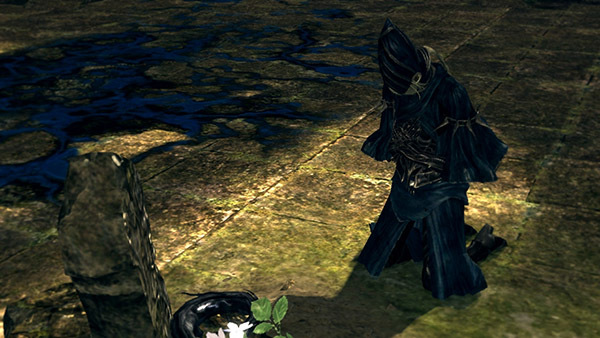 Given her dialogue and since the Hornet Ring is found behind Artorias's grave on a female corpse, she may have been very close to the fallen knight and possibly had romantic feelings for him. She prays in the arena where you defeated Knight Artorias. She appears only if you have Soul of Artorias in your inventory when you reload the area; otherwise, only Artorias's gravestone is there. Gifts you Gold Tracer and Dark Silver Tracer in exchange for the Soul of Artorias. Note that she drops these weapons if you kill her, so only trade the Soul of Artorias if you do not plan to kill her. She does not ask for the soul if it is not in your inventory. 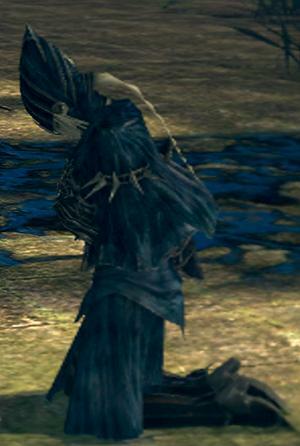 Speaking to her and refusing to give her Soul of Artorias will cause her to disappear and never return for the rest of the playthrough. If you plan to kill her, do it immediately after talking to her. She may throw Lloyd's Talisman at you. The name Ciaran is Gaelic for "small black one". Yet, "Ciaran" is the masculine version of the name (fem. "Ciara"). What appears to be her hair is actually part of her helm. I am here to pay respects to a dear friend. Please, allow me a moment alone. The soul of the man who fell on this spot? He was a dear friend. I wish to pay proper respect, with that soul. Please take this. I no longer need it. May the Lord guide thee. …I must not be presumptuous. Artorias would not have approved. What is it, something else? …always taking what you please. Then, I shall do the same. How did you imagine that the Lord's Blade would not reach you?